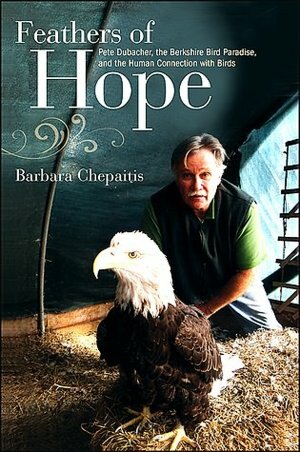 Feathers of Hope takes the reader on a joyful journey through the Berkshire Bird Paradise in Grafton, New York. Founded and maintained by Pete Dubacher, it’s a magical place that provides sanctuary to over twelve hundred injured or otherwise unreleasable birds, from emus, pigeons, and tropical birds to eagles, owls, hawks, and more. New York City residents regularly drive four hours to hand-deliver injured pigeons to Pete, and wildlife officials across the country have sent injured birds for his care, from an eagle mauled by a bear in Alaska to cranes left over from a breeding program in Maryland. In April 1999 two baby golden eagles were hatched from two disabled birds, and the surviving eaglet, Dotty, was successfully released into the wild, and in 2003 two bald eagles were, for the first time ever, hatched in captivity, raised, and released. I got involved with the book when the author connected with a Navy Seal who saved an eagle’s life in Afghanistant and thru the author and the Navy Seal working together were able to bring the eagle to the bird sanctuary.